Santiago stays. He does not budge when offered a walk. He does not budge when offered a treat. Not even a hamburger can lure this stubborn French bulldog away from his post, much to the disappointment of the little boy trying to engage him. 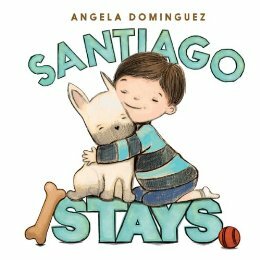 When the boy’s frustration bubbles over into a yell, it wakes the baby and the reader realises whom it was that Santiago was guarding in the first place. This familiar theme of an attention-seeking older sibling paired with the comically and characteristically stubborn French bulldog makes for a humorous and charming tale. All ends well with the boy and his dog playing together with the baby in a final joyous scene. Want to know more about what goes into curating San Francisco’s Cartoon Art Museum? Curator Andrew Farago was recently profiled by DC’s alt-weekly Washington City Paper. Farago gives insight into what it means to be the curator at one of the few museums in the country dedicated specifically to the medium of comics. 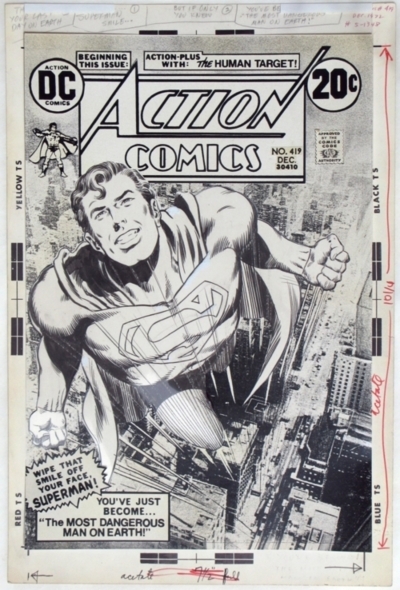 Next weekend the museum will be closing out it’s 75th anniversary celebration of Superman and during the interview Farago cited his exposure to the Smithsonian’s exhibit during Superman’s 50th anniversary as possible panting the seeds for the possibilities of comics in museums. The full interview can be read at Washington City Paper. The Superman exhibit runs until September 8. While at the museum be sure to check out the exhibits dedicated to Will Eisner and San Francisco-based illustrator Roman Muradov.